Most buyers will see your home online before they ever step foot inside. Personal items like family photos, unique art, toys, or collectibles can be extremely distracting and take attention away from the features of your home. Blank, clean counters, well-lit spaces, and clutter free rooms make for the best photos. Downplaying your personality allows buyers to envision themselves in that space. 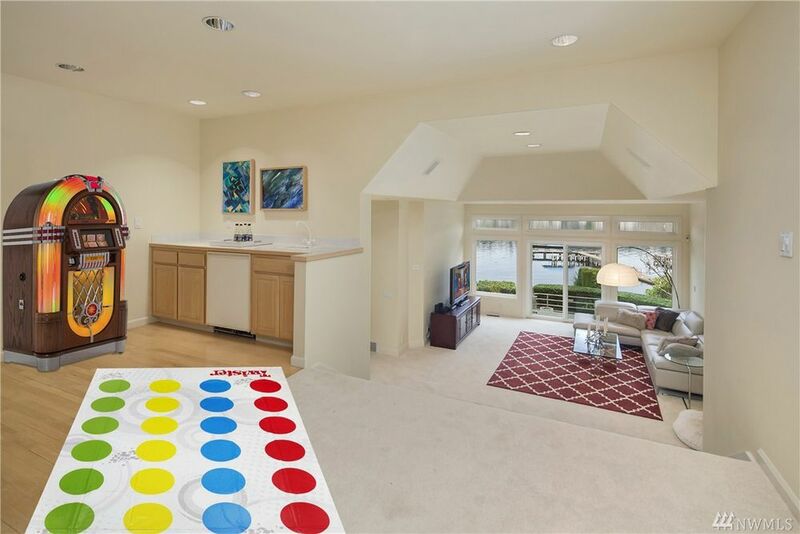 The photo is a funny example of what not to do- instead of appreciating the lake views and arched ceilings, buyers’ eyes are drawn to the absurdly placed Twister mat. Clear off coat and shoe racks or stash them out of sight. Take appliances off the kitchen counters. Stash them under the sink or pack them in boxes if you won’t need them. Make sure dishes and food are put away. Pack up toys and stuffed animals from kids rooms that aren’t played with often. You can get a bin for daily-use toys and hide it under a bed or in a closet. Avoid having toys visible in the pictures, including on the bed or in a corner. Make sure all lights are in working order, dark spaces photograph poorly. Consider renting a POD storage locker if you’re having a hard time finding a place to store things out of sight. They’ll take your boxes and store them until you’re ready to have them delivered to your new home! If you’re not sure where to start, we’re always happy to do a walkthrough and create a personalized list of “to-do” items. I know it can feel a bit uncomfortable to live without your personal things around you. I promise you’ll be glad you did!